Sunset Park, Brooklyn, is overrun with tacos. 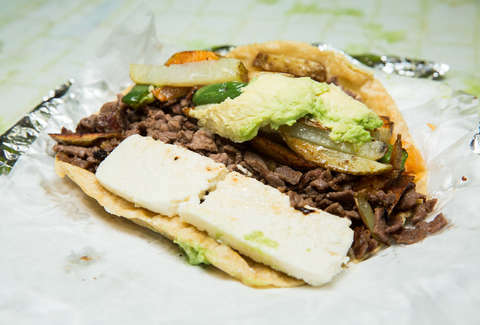 If you take the R Train to the 36th St station and wander around the neighborhood, you’ll find countless Mexican restaurants, taquerias, delis, and grocery stores selling pounds and pounds of queso. But tucked away on a quiet corner just north of Sunset Park is your ultimate destination: the unassuming Puebla de Los Angeles, a nondescript store that is essentially a Mexican deli, grocery, and bodega all rolled into one, with $5 burrito-sized tacos called tacos placeros (“market tacos”). Enter and scoot past the aisles stocked with canned chiles and spicy green chips imported from Mexico, past the Virgin Mary eyeing you from her post up above the fridges, and place your order through the small window where you can see the chef flipping tortillas on the comal. Aside from a few locals darting in and out to buy cigarettes or getting food to go, you’ll have the entire place to yourself. These aren’t your average tacos. The soft corn tortilla -- closer to the texture and thickness of naan than to a traditional taco tortilla -- gets warmed up on the comal, then stuffed with yellow rice, hot red-skinned potatoes, jalapeños, shredded queso fresco, and long strips of avocado. You can add steak or spicy chorizo, or opt for the vegetarian version where a whole boiled egg is tossed into the mass of rice and potatoes. Don’t bother ordering more than one, though; your stomach may believe you can eat at least two or three tacos like you normally do, but just one order is all you need to feel full. Eat yours on one of the two tables in the back of the shop, with your sleeves pushed back. Strands of rice and chunks of potatoes will inevitably slip into your lap, but no one here expects you to dine politely. Stick out your elbows, hold the taco straight up, and dive right in with a big bite. Amy Schulman is an Editorial Production Assistant at Thrillist who’s ready to grease her elbows and fight you if you think burritos are better than tacos. See what else she eats on Instagram.